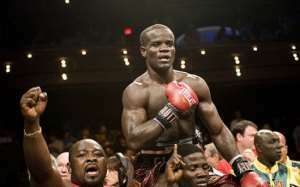 Former International Boxing Federation (IBF) World welterweight champion, Joshua Clottey, says he will consider retiring from the sport should he struggle to defeat Tanzania’s Mfaume Mfaume in a super welterweight clash at the Bukom Boxing Arena on March 30, 2018. Clottey, who is staging a comeback for the first time in three years, believes his body will not be able to continue with boxing should he have it tough in handling the Tanzanian. The Ghanaian pugilist, who fought renowned boxers such as Manny Pacquaio, Miguel Cotto and Zab Judah during his successful career, is expected to engage Mfaume in a contest for the first time since losing to Gabriel Rosado in December 2015. In an interview with the Graphic Sports, Clottey (39-5, 22 KOs) refuted claims that he was considering a return to the ring for money and noted that he was not going to earn a dime in his upcoming bout with the Tanzanian. "I feel I still have some strength to fight and that is why I'm making a comeback next month. But if I struggle to beat Mfaume, then I will consider retiring from the sport because he isn't any opponent that should give me a tough opposition. If I can't beat him easily, then it will be clear that the body is tired and I will give up on the sport," he added. When asked whether he has a chance of becoming a world champion again, Clottey explained that he was targeting a fight with WBA, IBF and IBO super welterweight titlist, Jarret Hurd, whom he believes he can easily beat. He, however, noted that he would need to train harder in order to realise his dream of snatching the titles from the undefeated Hurd who destroyed Jason Welborn in four rounds to defend his titles at the Staples Centre last December.